The world has become mobile - so will the scale industry. Imagine this: every morning you step into the office, plug your scale into your smart phone, get the readout right on your phone screen, then share the weight data with your colleagues - wiredly or wirelessly. Unplug your phone when all day’s work is done. Your app on your cell phone will pull out the report of your whole day’s work. You can send the report to any one at your fingertip! This is not sci-fi - it is now available from Prime Scales. 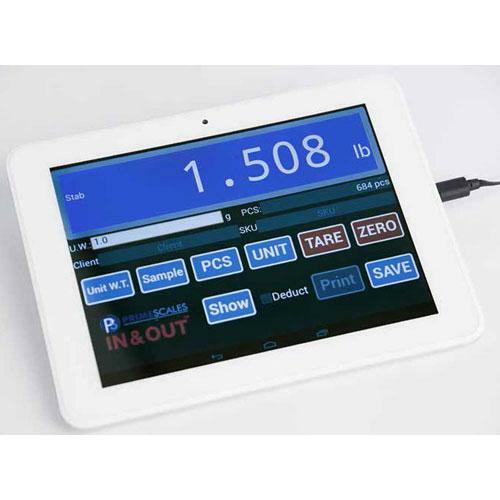 Our SmartPAD can save lots of time in weighing, counting and much more. Forget the heavy, bulky, hard-to-program indicators - we can customize any application for your business! We are offering very flexible solutions: you can order with or without the PAD. Everything works on your android system so you don’t have to double invest. Our PAD comes with basic software IN&OUT. It provides great features of weighing and counting. It comes with a simple inventory control as well.